Jess Riva Cooper finds artistic inspiration in the power of nature to reclaim spaces once occupied by humans. Jess Riva Cooper, a ceramic artist and educator currently based in Toronto, Ontario, integrates color, drawing, and clay to create installation-based artwork. The inspiration for some of her sculptures comes from fallen economic and environmental climates in regions such as Detroit, Michigan, where houses have become feral, disappearing behind ivy, trees, and kudzu vines that were planted generations ago. In Cooper’s words: “In my sculptures, the world sprouts plant matter.” Additionally, she has studied the foundation myths of the golem and dybbuk spirits in Yiddish folklore and reinterprets these traditional stories through a female lens. Cooper received her MFA in ceramics from the Rhode Island School of Design and her BFA from the Nova Scotia College of Art and Design. She has shown her work and participated in artist residencies throughout Canada and the United States, including such institutions as Brandeis University, Lillstreet Art Center, Medalta, Wassaic, and The Archie Bray Foundation. To learn more about the artist, visit her website at www.jessrivacooper.com. You’ve said you choose to work with clay because of the paradoxical nature of tactile immediacy and permanency inherent in this medium. When did you start working with clay, and what are the biggest challenges in using this medium? I began my artistic career as a painter, but discovered that I was more interested in incorporating painting along with the three-dimensional surfaces of ceramic sculpture. In my current studio practice, I integrate color, drawing, and clay to create installation-based artwork. The biggest challenge of clay is the delicate nature of the medium. Objects crack, shatter, explode, and slump. Because these are such common occurrences within the world of ceramics, the nature of clay has taught me to abandon any feelings of preciousness within my work, and has ultimately made me a better artist. You’ve also said you love exploring places and things that were once bustling and animated, but which have succumbed to nature’s mercy. What are some of your favorite visual examples of this? Valleys of kudzu vines and buildings overgrown with foliage are some of my favorite visual examples of nature’s force. Kudzu has proliferated through the southern United States, and with climate change, this invasive species has been spotted in areas of the northern United States as well. Introduced in the late 1940s from Japan and southern China as an erosion control measure, kudzu kills or degrades other plants by smothering them under a solid blanket of leaves, and by uprooting entire trees, power lines, train tracks, and concrete through the sheer force of its weight. Vining plant life like kudzu is also reclaiming thousands of abandoned houses. In Detroit alone, there are currently over ten thousand abandoned houses. In the summer months, these structures become feral, disappearing beneath ivy, trees, and other foliage that was planted generations ago. When you were an artist at the HBI, you created an original, site-specific drawing and ceramics installation that reinterpreted the folkloric stories of the golem, a creature created to do a person’s bidding without question, and the dybbuk, a mischievous spirit, through a feminist lens. What fascinates you about this? How does it fit into your interest with nature/plants? In the original stories, as well as in the 1914 play The Dybbuk (or Between Two Worlds) by S. Ansky, a dybbuk is a spirit of the dead who was wronged in some way and who has the ability to possess a person in order to complete his or her unfinished business in the world of the living. Rachel Elior states in her book Dybbuks and Jewish Women, the dybbuk could also be a mechanism used by women or other marginalized persons to escape from the demands of an all-encompassing patriarchal social order. Within my sculptures and drawings, I investigated the idea of a dybbuk as a protective garment; perhaps these women were working together to create, sew, and sculpt armor made of these spirits. I see a direct parallel between my interest in insidious plant life and a dybbuk taking over and consuming a human body. In both situations, a loss of control is seemingly suffered as the parasitic entity subsumes the host body. What most interests you in seeing the natural world take over man-made structures? Do you find hope in that, or something else? I find hope in the idea that without intervention, nature can take over our abandoned places and can breathe new life into these spaces, as it does in my sculptures. Like the busts of my Viral Series, degraded buildings or decomposing houses, once pure and perfect, are hardly recognizable. They become tattooed with nature. Beings and buildings transform into new life, into hybrids. Often used to represent life, nature instead becomes a parable for an alternative state – one where life and death intersect. What piece of yours has given you the most satisfaction to complete so far and why? My installation Perilin, has given me the most satisfaction and excitement to complete. It was the first time I created a large on-site installation, and I only had 20 hours to complete it. The entire sub-structure of this piece was constructed of thick, wet clay slabs laid on top of mattress foam and plastic-wrapped boxes. I then took hundreds of fired porcelain plant forms and figures and pierced into the soft clay using it as a pincushion. The finished work is 6ft. x 3ft. x 5ft. Perilin is named after a chapter in Michael Ende’s contemporary German fairytale The Neverending Story, a novel about Fantastica, a world parallel to our own that is quickly being destroyed. The protagonist, Bastian, first arrives in Fantastica through Perilin, the Night Forest, a space of complete emptiness. His desire builds upon desire, until he fills the void he finds with the power of his imagination. This begins when Bastian, by the mere act of wishing, causes a single seed to grow. What are you working on now, and how can we see it? I am currently preparing for a solo show this summer at the Canadian Clay and Glass Gallery in Waterloo, Ontario. This work will be similar in idea, but larger in scale, to work I had at the Gardiner Ceramic Museum as part of the 4th Annual RBC Emerging Artist People’s Choice Award, from September 2 to October 14, 2014. 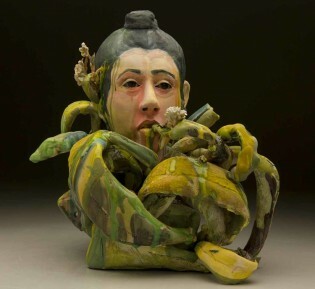 The exhibition honors five Canadian artists who have been out of school and practicing professionally with clay as part of his/her artist practice for seven years or less. A national panel of artists, curators, and arts educators nominated the five emerging artists. Jess Riva Cooper’s wonderfully creative and artistic sculptures and instillations push us to actively take part in her ‘Never Ending Journeys’.